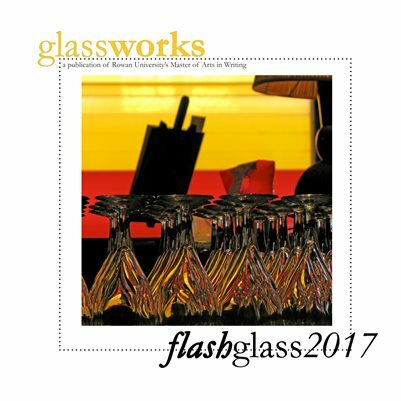 We are pleased to present our annual flashglass anthology! Comprised of all flash works originally published online at rowanglassworks.org in 2017, this anthology is available for online viewing and for purchase in print. Copies will also be available for $5 cash at the AWP Conference and Bookfair in Tampa this March and at our upcoming readings at Rowan University. Thanks to all our contributors for allowing us to present their work this year! The girl in the feather skirt gets tired of waiting for her story to start. When would the mushroomy underside of the moon explode? Darling, she writes, I’ve sold your clothes. She loves the slash and glister of her pen. By the time you read this, my ship will be en route. Here on board, gold-tasseled tablecloths sway. Petal by petal, an inchworm crosses the centerpiece of lilies and phlox. The galley door swings, dishes clink, a kettle hisses. Sometimes she strokes the cricket in her pocket for luck. Here on board, staircases unfold into silken dark and tenderness begins at its regularly scheduled time, nothing like a coin purse snapped closed. Snowflakes fall like whispers and someone keeps shaking the globe. To Whom It May Concern: Today I plunged into the living room and the lovely bubbles of my breath rose through the crystal ropes of the chandelier. Sunlight on water makes waves like fish scales, iridescent even from underneath. The pale overstuffed couch swayed. Blurry shadows soared above the surface, calling each other with reedy, two-step notes. The windows are open but the water will not leave the house. That’s one hidden rule. Here’s another: inside my sleep I am never lonely. I’ve set out white teacups on the windowsill for us, a little trail of bones. 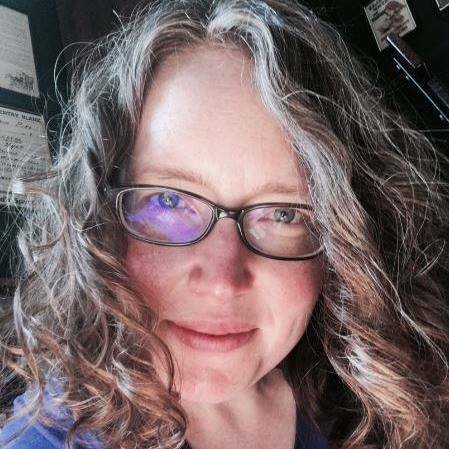 Kathleen McGookey has published three books of poems, most recently Heart in a Jar (White Pine Press). Her work has appeared in journals including Crazyhorse, Denver Quarterly, Epoch, Field, Ploughshares, Prairie Schooner, and Quarterly West. She has received grants from the French Ministry of Foreign Affairs and the Sustainable Arts Foundation. ​Come prepared to convert the locals with your duffel bag of lipstick, ramen, t-shirts and the Good News in translation. Laugh at each challenging cross-cultural situation and tell everyone how much you love kasha. Say God loves you to the babushka who scolds you for sitting on cement, then cry as she helps you out of an open sewer grate. Embrace the homeless children who call you mildly obscene vegetable names while you feed them soup. After the near break-in, start sleeping with a bat beneath your bed. Stop sleeping. Keep your coat on at all times. Let no one in your room while you reread the book of Job. Struggle with your lust for an aging ex-con you meet at the mini-bus stop. Fall in love so hard you fall off the daybed, so drunk that soon the bedroom stops turning back into the living room. Drink Baltika No. 9 for breakfast with the shades down. Treat your sinus infection with fate. In the outdoor market, procure a wandering eye and a missing finger, a scar of unknown origin, and a knuckle prison tattoo. Eat nothing but cooked macaroni until your skin turns translucent. Teeter on spiked heels; fend off pickpockets with witchcraft. Step over the bodies by the tracks. Get on any train you want without a ticket. The diner cringes in snowfall. Parked pickups sneer as I slog to the door and peer in. The men at the counter hulk like Easter Island’s giant heads. They don’t bother to turn to watch me dripping in the doorway. Despite their hairy exteriors and filthy mouths, these men are devout churchgoers, whose Sundays yawp with hymns shaped like dirigibles and just as lofty. I want to explain to them that I once believed in both physical labor and spiritual bliss, but something underground derailed, and the blue sparks of dragging steel illuminated places I hadn’t imagined. Now I want to delve into distances brisker than the wind on the river, want to track through matter tougher and more permanent than snow. They’d laugh, of course, and look at me with dutiful Christian pity. Poor old coot, they’d mutter. Too much education for his own good. Too much mind to lose. Too many horizons bleak above his carcass as he naps. They’re right, of course, their faces brimming with health and ignorance. Better not to know how deeply the starlight despises us every night, how indifferent the winter daylight blue. And now, enveloped in snowfall, this diner sweats and smelts and crushes us all together in a scent of flesh so powerful even extinct carnivores threaten, their saber teeth glinting in the stainless landscape outside. William Doreski lives in Peterborough, New Hampshire, in a small house in the woods. He taught at Keene State College for many years, but has now retired to feed the deer and wild turkeys. He has published three critical studies, including Robert Lowell’s Shifting Colors. His essays, poetry, fiction, and reviews have appeared in many journals and several small-press books. His forthcoming book of poetry is The Last Concert (Salmon Press). The crumbling steps now lead to no one’s front door, just a miniature precipice, a leap into the slumping depression left behind when everyone had had enough of whatever it was that ground them down. Resting in the soil: shattered glass; a bent fork; the scattered shards of a dinner plate; a metal box of rain-soaked recipes. Above, the planted trees huddle, swaying like a family around a hospital bed, waiting for the doctor’s bad news, already starting to mourn, thinking of who might take the piano and whether the cousin who drinks might want to be the last occupant, or could it be rented out to a hired hand, or could the siding be salvaged for a nephew’s barn, or whether to let nature take its course. Still, along the unworked dirt, near what might have been the view from the kitchen window, whose maroon awning someone might still remember, the rhubarb arteries stretch out straight and grasping for space, red as the face of an uninvited guest, and carry to the extremities of life the promise of one last dessert. Mark Trechock lives and writes in Dickinson, North Dakota surrounded by wheat and grass and quite a few abandoned farmsteads. His poems have recently been published in Passager, Triggerfish, High Desert Journal, Jonah Magazine, Kestrel and Red Wheelbarrow. Comingled blood, dark as windfall cherries, spattered lichen-streaked stones: grandfather (dead of foolishness), still-born Baby Anne—your family plot. And you might have sprung, angle and bone, from that corner yew, dark, with dark lank hair while I was mere summer folk, city girl—pudgy, pale, whiskey-colored ringlets. But on that garland branch, we pricked thumbs, became sisters. Envy grew green as island pines. Your narrow saltbox: high-ceilinged rooms, chamber pots beneath iron beds, stone-floor kitchen with hand pump and black, wood-burning stove—matriarchal dragon dominating the room, captured me. Your grandmother, brown and bony as yourself, knew things. I trotted behind as she gentled Sunday’s chicken. Ax arced, shell-carved eye stilled while deranged feathers convulsed in mad, mute tarantella. I was baptized in blood. You hungered only for trolley rides, glass revolving-doors, luncheons on the mezzanine, until you turned fifteen—one umbrella step ahead as always—left for New Orleans, a married woman. Island wives lashed tongues, raised long, red welts on your memory: Got herself in trouble. Uh-huh. I alone knew it wasn’t love or even lust that lured you; it was city lights. Had I been offered spells and incantations, I’d have gone too. Ann Howells’s poetry appears in Borderlands, Spillway, THEMA and in anthologies: Goodbye, Mexico and The Southern Poetry Anthology, Volume VIII: Texas (Texas Review Press), Pushing the Envelope and Texas Weather Anthology (Lamar University Press) and elsewhere. She has edited Illya’s Honey since 1999, recently going digital (www.IllyasHoney.com) and adding a co-editor. Publications include: Black Crow in Flight (Main Street Rag), Under a Lone Star (Village Books), Letters for My Daughter (Flutter), and Cattlemen & Cadillacs, as editor, (Dallas Poets Community). Ann served as President of Dallas Poets Community for four years and as Treasurer for many more.